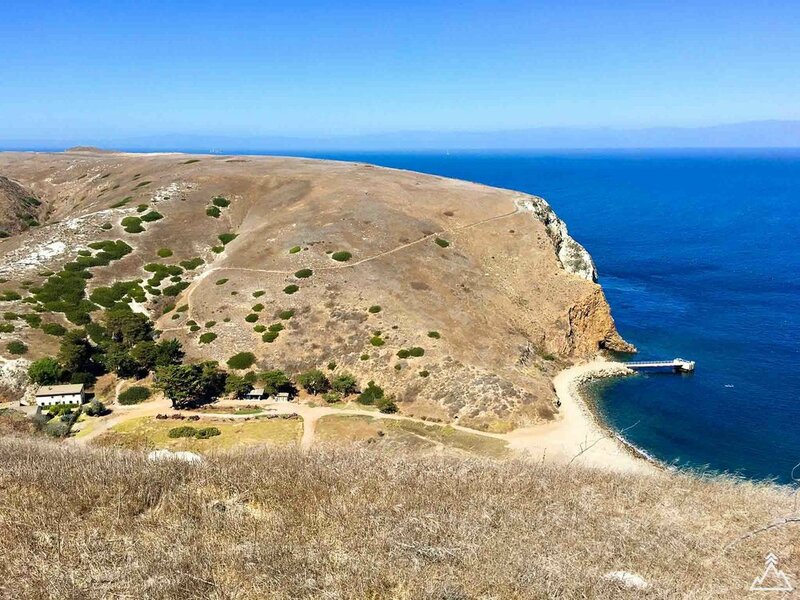 This hike begins at Prisoners Harbor on Santa Cruz Island, which has very little infrastructure other than a dock, a couple of benches and toilets (in contrast to relatively busy Scorpion Harbor which has a large overnight campsite). Taking the 9AM ferry from Ventura Harbor means you will start your hike around 12:30PM. Once you get off the boat, you make your way to the left past the toilets to begin the trek. 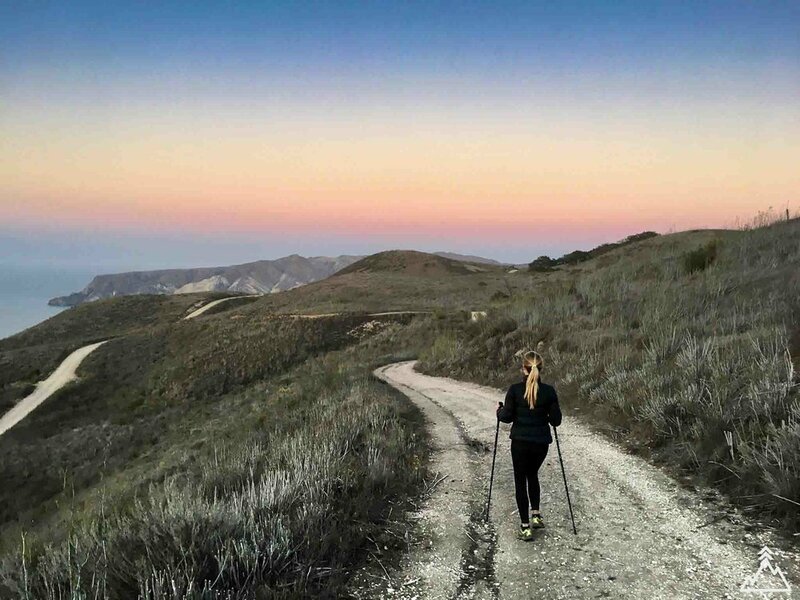 The path over the next 3.5 miles follows the coast and traverses over several hills and ravines in succession until you reach Del Norte Campground, which has fabulous views of the ocean. In selecting a campsite, we recommend taking the most sheltered campsite possible to avoid the ripping winds that can be common in the evening. Optional kicker: After setting up your gear, continue south past the campsite towards Mount Pleasant until you intercept Navy Road. You will be making a relatively steep 1,600 ft climb to a good viewpoint. Continue towards Scorpion Camp on Navy Road for about a mile until you see a turn off to the right with a water tank at the top of the hill. This is a prime location to watch the sunset and get great coastal views of the island. You will most likely encounters lots of cute island foxes while at the campsite, which seems to be one of their favorite haunts. They also tend to come out primarily in the evening and early morning. Be sure to keep your camp food locker closed or they will absolutely try to sneak in. These critters do not seem to be very shy, so you will get lots of opportunities for close up viewing and photos if you are patient. Plan to get going early the next day to make it to Scorpion Harbor to catch the ferry, which departs at either 3:30pm or 4pm depending on the day. 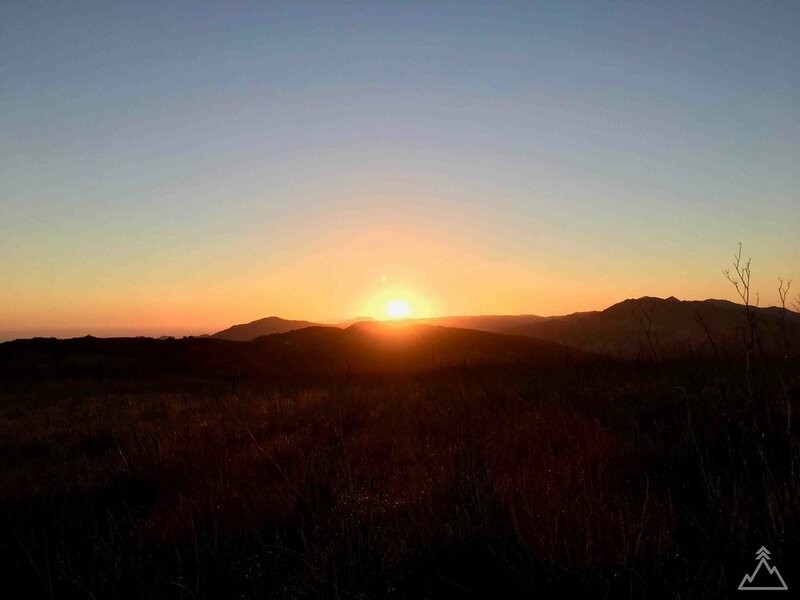 From the camp, you will continue to walk along the coast and then up to the center island ridge line which offers spectacular views of the ocean on both sides as well as the California coast. About 6 miles past the campground you will summit over High Mount which is the tallest peak on the island. From here you can get the best 360 degree views of the island. 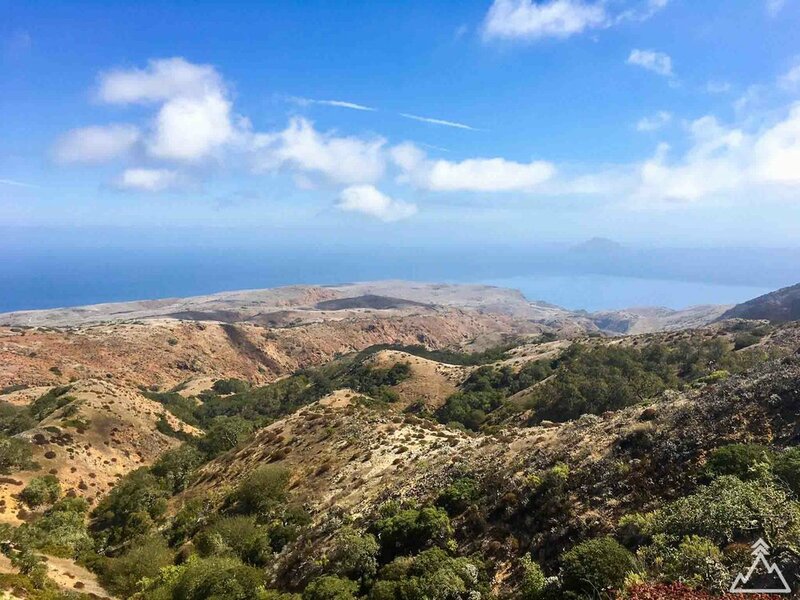 After the summit, the final 6 miles consist of a downward grade where you can get some views of much smaller Anacapa Island to the east of Santa Cruz Island. The hike ends at the much more busy Scorpion Harbor, where you are likely to see another batch of island foxes as well as the multitudes of birds which populate the nearby beach. From here you can take the ferry home, or opt to stay another night at the Scorpion Canyon Campground (see pro tips below). Book your campsite - The first thing to do is make sure there is availability and book a campsite at Del Norte Campground which is the backcountry camp site on the island and costs $15 for a reservation. This campsite is about 3.5 miles in from Prisoners Harbor and 12 miles from Scorpion Harbor. There are 4 campsites at the campground and they are all first-come first-serve. Book your ferry - To get to the island, you need to book a ferry with Island Packer Cruises from Ventura Harbor, which costs $79 per person round trip. You will need to be dropped off at Prisoners Harbor and picked up and Scorpion Harbor (recommended, see information on potable water below). This option is not available on the website so you will need to call to make your reservation. They will want to verify that you have a reservation at Del Norte Campground before issuing ferry tickets. 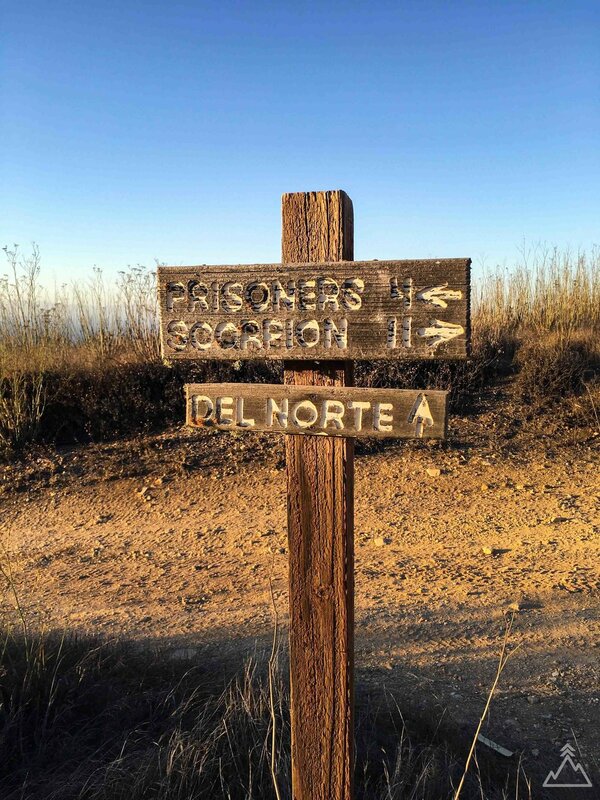 Plan your water strategy - There is NO POTABLE WATER either at Prisoners Harbor or Del Norte Campground. All water for the duration of the hike needs to be packed in since you won't be able to refill until you reach Scorpion Harbor at the end. This is why it is recommended to start at Prisoners Harbor so you are carrying your water for cooking the least amount of distance. Accommodations - Since you have to get up early to catch the ferry (they ask that you arrive well in advance of departure), it is easiest to stay close to the ferry in one of the Ventura Harbor hotels. You can also plan to stay here after your trip to relax and shower without having to drive long distances. We stayed at the Four Points by Sheraton Ventura Harbor Resort, which worked well. There are a couple of additional options such as the Holiday Inn Express and a couple of bed and breakfasts. Stay on the island an extra day - You can extend your trip an extra day which in hindsight is something we wish we had done. On the second day instead of taking the ferry back to the mainland, stay another night in Scorpion Canyon Campground. 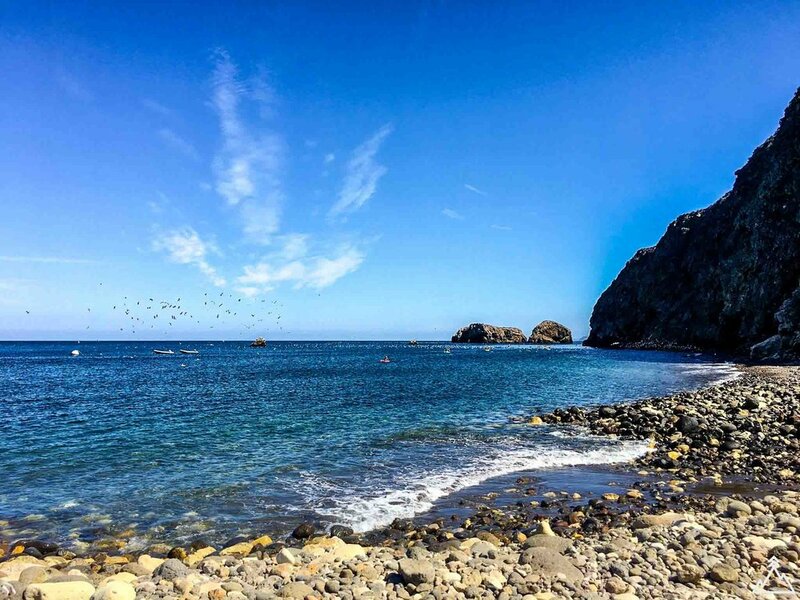 This allows you to take your time on the second day of hiking, and to enjoy the island for an additional day without the weight of a heavy pack. The next morning, take a kayaking tour to see the famous sea caves before heading out. Below is the address for the ferry terminal to get to the islands. Click on the directions icon to pull up custom directions in Google Maps.